It's been a busy week around here. I can't believe I'm posting two "Favorite Links" posts back to back. So any post ideas... So little time. Here's what I've been reading this week though! Love the illustrations with the white on black with large accents of color. My son and I enjoyed Fred's big glasses! It would be fun to stop short of the big reveal of what's under the bed and let your students or children make predictions of what it will be. You could make a list of predictions, or they could each draw a picture of what they think it will be, which would be really fun. Have them use adjectives like in the story to explain their drawings. Great vocal practice! This was the perfect little math lesson for my little guy. His favorite was the end when Little 1 is joined by a red hoop and they make a 10. He was so proud of himself for knowing that! This is a great invitation to talk about what your child might want to be someday. Charming illustrations. Reading this one was such a hoot, because I didn't sit down and read it with my kids. I just sat outside flipping through it on my own while they played, and they all ended up flocked around me, begging to know what my book was about. Love. There of course has been much buzz about this book lately. Like everyone else, I loved it too. A uniquely sweet tale that leaves you with the warm fuzzies. A different spin on this classic boyish theme. It takes talent to create a book with construction vehicles as the subject that is completely gentle and soothing. Of course, perfect for bedtime, or nap time (which is when we read it). I think I might fill our sensory bin up with some dirt or sand and let my son recreate this little story with his toy cars. He and I can take turns tucking all the trucks into "bed" for the night. Awesome illustrations. My son and I talked about how different human babies are from animal babies, and how he would be too scared to ever wander off at night alone like that. It was fun to think of all the other differences we could come up with too. So much dress up fun in one book! I'm sure if I had a girl she would be gaga for this book like me! My little boy liked it, but it isn't one of the books he asks for over and over. It would be fun to do some fun fashion designing crafts with a little girl after reading this one (like fashion plates that I played with when I was kid). I enjoyed looking and looking and looking at the dresses (and accessories) in this one! My boys are not ones that typically go for wordless books, but they loved this one! Loved it! They asked for it several times, and they just kept talking and talking about it after we finished reading it. They wanted me to leave their light on so they could sit in bed and discuss what things they would draw with the magic chalk if they had some. Each time we read the book, we discussed a different element of it. Very good. Highly recommend it! The retro feel of this is so much fun. As a parent, I appreciated the hilarity of the mama bear telling the baby bear what a "terrible pet" children make. There was much discussion from my boys over why the little boy talked in squeaks (which I also got a kick out of). Very cute! My boys really loved this one! Two toys, a shark and a train, have a debate over who would "win" in various different situations. Great for predicting, great for making fun charts and lists, great for fun discussions. I love this one for a read aloud just with my kiddos, or with a big group of kids! Brilliant! 1. Keep them in one place. There's also this cute idea for a place to keep your library books! 2. Have a list of what you have checked out. This idea is easy in theory because just about every library will print you a receipt with the list of books you have checked out. They will also usually keep a list of what's checked out on your online library account. The online list is much more helpful than the paper receipts that get lost and are hard to keep up with. Plus, if you make multiple library trips, your online account will still have everything checked out, on each visit, listed in one place. My family's challenge is that we have three library cards we use and so I have to make sure I check the online record for each card, or I will miss something! Our library sends email reminders when things are coming due, and that helps a lot. I recommend opting in for that if you can at your library. There is also an online service called Library Elf that looks like it could be helpful with keeping track of library books! 3. Visit the library regularly. It's a great idea to have a specific day you visit each week. That way, stuff gets returned regularly, and on time. The idea is to check out only what you think you will be able to read in a week, or two weeks (however often you are visiting), and then bring it all back on your next visit. 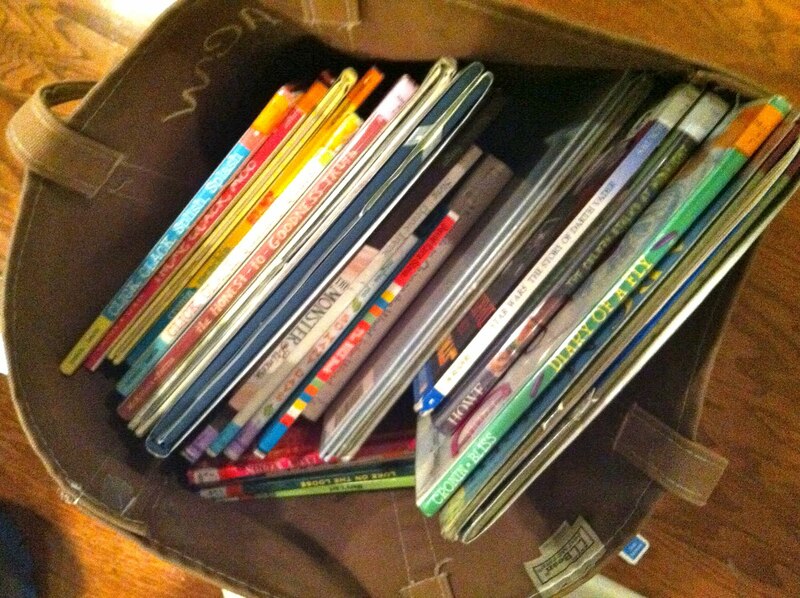 Our family's challenge is that we have two local libraries we visit. We have more than once returned the wrong books to the wrong library, even when we were trying to check and be careful. So on top of trying to keep all the usual library book stuff straight, we are trying to keep it straight for two different libraries! It's a wonder we haven't had to pay more fines than we have! My other problem is that I have no restraint when it comes to checking out books. I will always check out more books than I can read in a week or two. Always. There's no hope for me. Considering all the challenges our family has when it comes to keeping up with library books, I guess I should be happy with our success rate. I've decided that what I need to do is check my online account regularly, and print a list off when I return things that I can check things off on. I need to know for my own sanity which items got put in the drop box and which didn't. Beyond that, the best I can do is simply try to be careful. How do you keep track of your library books? Help me! Looking for a way to add some magic to your story time? 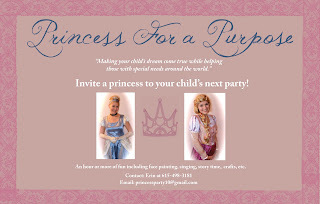 How about a visit form Cinderella! My dear friend, Erin, embodies the Cinderella persona like nobody else! She came to visit our local library story time this past week. 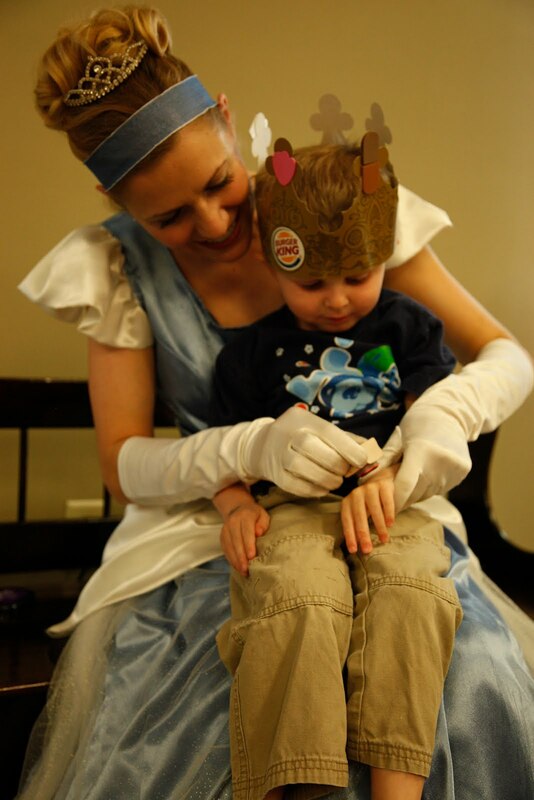 Word got 'round that Cinderella was coming to read stories and the story time room was packed to the hilt. Mostly with little girls in princess dresses, but there were some boys too! There was such a crowd that Cinderella had to use a mic to be heard. 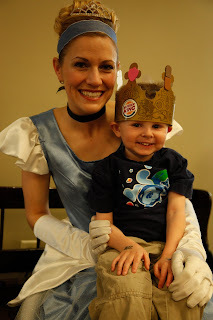 Cinderella read stories, sang beautiful songs, had crafts for us to make, and took photos with the kids. The kids (and adults) were all dazzled, and a good time was had by all! Isaac's buddy was there at story time with him, and both boys seemed totally mesmerized. Isaac even wanted to stand in the mile long line for a photo with Cinderella! I loved Cinderella's animated reading. Marsha, the librarian, worked as the book holder, and you know a good children's librarian when they can't resist making animated facial expressions even when they're just holding the book! What a great idea to have Cinderella come be a great reading role model! And Cinderella does story time at birthday parties too! What a wonderful way to celebrate a special day, and encourage reading! Brilliant! Please forgive me for any typos or mistake you might find. I have caught some nasty virus and feel like I have been run over by a truck. Sounds like I might be down and out for a week or more if what I hear about this virus is true. Who has time to be sick??? I recently got to play with a big stack of Child's Play books, and was so pleased with what I saw. I was excited to get to look at these titles, because my hubby and I grew up with Child's Play books like There Was an Old Lady Who Swallowed a Fly and This Old Man. Most of the titles I looked at were concept books. They have a What Can I... series of board books for babies and toddlers that are charming! Nice, brief text, but filled with fun, descriptive words. My teacher brain and mommy brain gets going anytime I look at a book, wondering how I could get my kids involved with the book, or do an extension activity. A toddler or twos classroom could do a really fun little "senses" unit with these books, or put them in their science center with a "senses" theme. And you could obviously do the same thing as a mommy, at home with your kiddos! See if you can find similar items to what is listed in the books to see, touch, taste, smell, and hear. And then look for other things to explore beyond what's listed in the books. 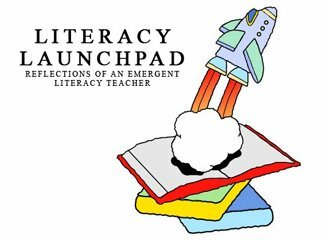 These books are simple, and sturdy so your kids can play with them, tote them around, bang 'em up, and they will hold up! I also got to look at the First Time series. These books are larger, and made out of a tough card stock material. So they're a bit different from the board books, but still plenty sturdy. What I enjoyed about these books was the text. It's not your typical "first you do _____ and then _____ happens..." etc. Instead, they're written in a conversational style: "I like your bed. Can I sleep on the top bunk? Say hello, Rabbit! Say help, Dolly!" (from First Time Sleepover). The First Time series have dramatic play center written all over them! My favorite was Snug by Carl Thompson. It's a sweet, sweet book that talks of all things snuggly. The cover is a bit misleading. I thought the illustrations and text inside were much more whimsical than what the cover leads you to believe. Again, the teacher brain in me is always going and I kept thinking how fun this would be on pajama day when the kids are all snuggly and get to bring in their stuffed animals! Looking through the Child's Play catalog, I was a bit disappointed that they didn't send me some of their other titles to sample. There were more than a few in there that looked especially beautiful and fun! I marked a couple that I would like to get to use with my kiddos at home. Do you have a favorite board book series or concept book series?